What will the Digital Scotland project deliver? Scotland has always had a lower target in terms of fibre based broadband coverage than the rest of the UK, with a contracted goal of 85% fibre based broadband by March 2016. A new report by Audit Scotland highlights the uncertainty of what the massive Digital Scotland project will deliver and also tries to call for better information to be made available so people and businesses can identify when they may or may not see improvements in their broadband options. The report is keen to emphasis that the 85% target in Scotland carries no speed qualification and possibly for the first time reveals that the actual contract carries modelled broadband speeds of 23% getting under 24 Mbps, 22% between 24 and 30 Mbps and 55% achieving 30 Mbps or faster in the areas helped by the project. Looking beyond the current infrastructure project some work has been done to estimate the expected coverage of superfast broadband by December 2017. While the audit report does distinguish between fibre based and superfast coverage, we are not totally sure whether the expected coverage in Exhibit 5 is actually premises at faster than 24 Mbps (or 30 Mbps if EU money used) or is simply fibre based broadband again. A major problem for the Digital Scotland project is the sheer number of premises involved combined with the vast geographic area covered. The distinct differences across Scotland led to the creation of two projects, Highlands and Islands and Rest of Scotland. 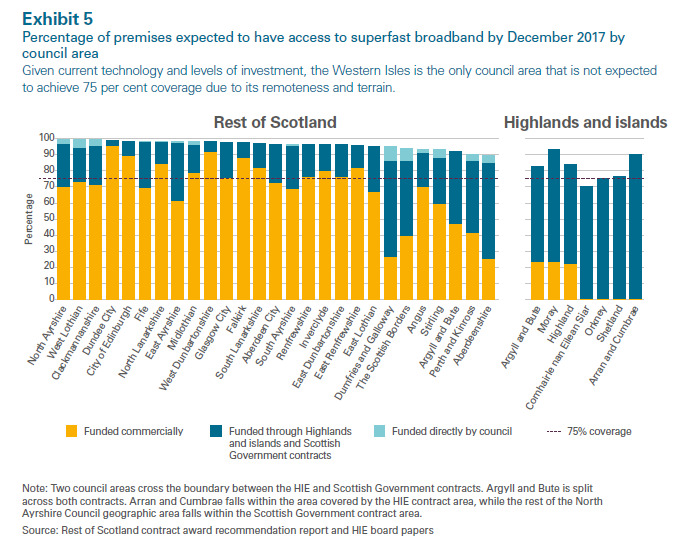 In the Highlands FTTC is so far proving to cost almost double the original framework agreement, with FTTP coming in at almost three times framework agreement, meaning that the use of FTTP is being minimised. The situation is different in the Rest of Scotland as FTTC is coming in at a lower price than the framework agreement and FTTP at double the framework agreement. The risk and cost of ensuring the contractual targets are met does rest with BT and clawback clauses do exist, the stated aim being that if take-up triggers money coming back to the Government it will be re-invested to further improve coverage and speeds. "78. The Scottish Government was to pay £15.6 million for the work completed in the nine months January to September 2014, provided BT met its contractual target and could claim sufficient eligible expenditure for work completed up to that point. While BT met its contractual target for the period, it claimed only £14.3 million for the work done. The difference (£1.2 million) is work in progress and will be claimed later. 79.HIE paid BT a total of £26.2 million for work completed between September 2013 and September 2014, comprising £19.8 million for backhaul infrastructure and £6.4 million for work connecting premises. It originally planned to pay £52.3 million over this period, of which £38.9 million was to be for backhaul infrastructure and £13.4 million for work connecting premises." Part of the reason for less money being paid to BT has been that delivery has not always kept pace with the original plans, the Highlands and Islands were 1,250 premises behind their target as of December 2014, and after a shortfall in the Rest of Scotland in the first part of the last year in the quarter BT running up to December 2014 had managed to make up some of that shortfall. The Scottish Government is not the only body watching the roll-outs closely and our calculations on what has been delivered so far both commercially and via the Digital Scotland and Virgin Media coverage is shown below. 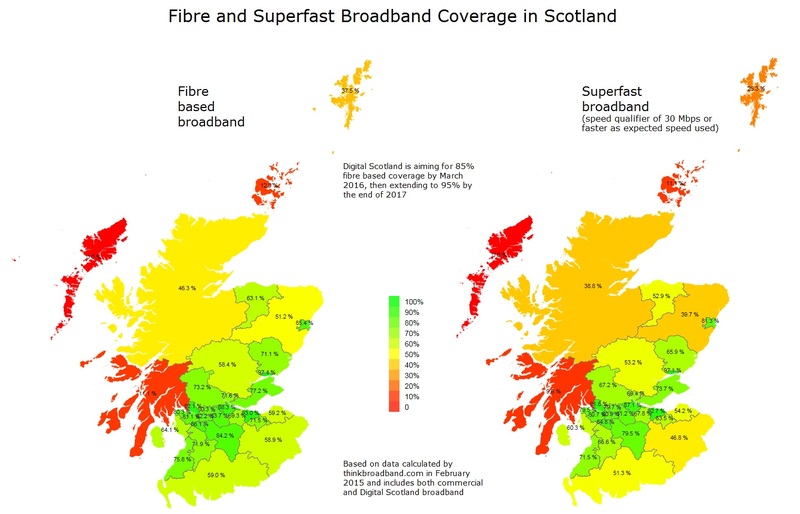 The Highlands for example may seem well covered, but the overall figure is skewed by the good fibre based coverage in the Inverness area. The superfast coverage figures are based on premises where we believe that speeds of 30 Mbps or faster will be achieved. The overall figure for Scotland is 74.5% fibre based broadband coverage and 70.8% at superfast speeds. We will be continuing to track the coverage and the subsequent uplifts in actual broadband speeds as people buy the faster options once they become available. It is good to see H&I are on actuals not milestones, I must search for a record of BT contribution. I just wish that BT would allow those directly connected to the exchange to get fibre. Some areas are getting work to convert lines from Exchange Only to cabinet and FTTC, and in some cases even FTTP. So it is very much down to how the numbers stack up for your actual area. As getting FTTC or FTTP to the EO people involves more work than those already with a cabinet the EO stuff is often done at a later stage. Plenty of EO lines in the Culloden/Smithton/Westhill areas of Inverness now connected to new PCP cabs. However, we are going to build new cabinets for EO lines in Inverness starting early next year and it may be that your line will be connected into one of them. If it isn’t then it is likely to be rerouted, which unfortunately isn’t an easy process, into a cabinet near you, possibly the ones your neighbours are on. As I am sure you can imagine rerouting cables takes a lot of planning and work on the ground, but we are getting there. I imagine a lack of awareness of products might be holding back the speeds (in any part of the UK). Many people stick with their existing product because of price, or reliability (or even because ADSL2+ is fast enough for them).